The Caribbean offers some of the world’s best diving spots and, at Sandals Resorts, it’s all included. Sandals offers one of the most comprehensive resort scuba diving programs in the Caribbean, providing equipment, staff and stunning dive sites to guests who can take advantage. Everything guests need is available. 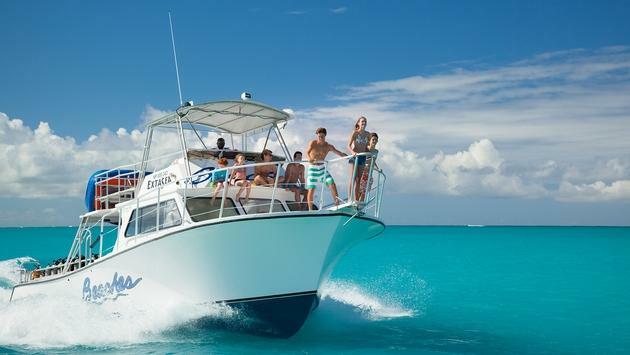 Top-of-the-line regulators, BCD’s, masks, snorkels, fins and tanks are all provided, while state-of-the-art, twin diesel Newton boats transport guests to each site. At Beaches Turks & Caicos, guests can take advantage of an exclusive Luxury Included event, Dive-In With PADI, taking place September 21-25, 2018. Guests can book the dive package for $450 per person and receive daily dive trips, a night dive, an underwater treasure hunt, a swag bag with a Red Lane Spa Credit, attend a special beach bonfire and more. While guests can participate in special dive events, access to diving is all-included year-round. For example, at the Sandals Royal Bahamian in the Bahamas, guests can choose from 32 dive sites for novice and advanced levels. The Royal Reef is just a few minutes by boat from the resort on the east side of Sandals Cay, and on the west side of the resort is Grunts Tavern. Guests also have access to the Lighthouse Wreck by the entrance of Nassau Harbor, the Mahoney Wreck, which dates back to the 1800s, the Oasis Wall, the Tunnel Wall and many more. In Saint Lucia, Sandals guests have access to nine novice sites and 12 advanced sites, including the novice-level Virgin Cove, where divers often spot barrel sponges, brain coral and occasionally stingrays along a semicircular reef/wall. Advanced divers can head to the Lesleen M Shipwreck where they can explore a 165-foot freighter sunk by Department of Fisheries in 1986 to create an artificial reef, which is now inhabited by lobster, moray eels and reef fish. In Barbados, guests can take advantage of 27 novice and advanced dive sites, including several shipwrecks and the beloved Bajan Queen. The boat began as a tugboat called the Pelican during the construction to the Bridgetown Harbour, and was later converted into a party boat and renamed “Bajan Queen.” It was then donated to the Coastal Zone Management Unit and sunk on 19th May 2002 in Carlisle Bay Marine Park. Master divers will enjoy diving with Sandals in Jamaica where there is access to several sites, including the Point, with a depth of between 80 and 110 feet. At Middle Shoal Reef, master divers will find a small single-engine plane, spadefish, barracuda, beautiful coral and more. There are several other master-level dive sites available, including Devil’s Reef, where guests can see turtles, Atlantic spades, eels, nurse sharks and more. Dunn’s Deep, just 10 minutes from Dunn’s River, is filled with barrel sponges, sea fans and gorgonians. There are also optional scuba programs available at Sandals, including certification courses starting at $100 and specialty courses to increase safety levels or to focus on learning.